This programme aims to provide students a fundamental understanding of marketing with a strong focus on digital marketing. With more than 4.87M and 2.45B netizens in HK and worldwide respectively, marketing via E-channels is critically important to acquire and retain customers in a timely manner. The class will cover key marketing management topics with comprehensive and in-depth coverage of website & E-commerce management and email / search engine / mobile / social media marketing. Register this programme now to grasp the know-how of digital marketing and run it better and faster than your competitors. To equip entry-level executives with the concepts, practical guidelines, latest developments, and best practices of digital marketing in order to advance their knowledge and career. Learners who are new to marketing, with a particular interest in learning how to expand business and engage customers through digital medium. This programme comprises seven modules - six must-learned marketing and e-marketing modules, plus a Management Project, to help students building comprehensive knowledge and apply it to real-life management project. Lecturers will use case studies, group presentations, discussions and debates to enhance learning. This Digital Marketing course can be completed in ten months. It consists of seven modules, with a diploma being awarded upon successful completion of the course. To learn an overview of various types of digital marketing, manage effective website, get insights from global online shopping studies, manage different types of social media, and understand the business model of social commerce. Overview of Various Types of Digital Marketing - Digital Advertising, Partnership Marketing, and Corporate Channels. How to Allocate Online Marketing Budget? Should you use Group Buy Site to Sell your Products/Services? What are the Factors to Consider? To equip students with a thorough understanding of how information technology had changed the marketing system and the activities of business people within it. To ensure all students are aware of the major impact of information technology on the commercial environment and potential customers' life style and buying habits. To enable students with contemporary understanding of Big Data and related analysis tools in making marketing decisions. Defining the scope and application of "Big" data, such as Modeling Technique. To learn the features, benefits and know-how of managing display advertising and search engine marketing, email marketing and mobile marketing campaigns. How to Read Advertising Rate Card, and Identify the Right Advertising Channel, Ad Unit and Pricing Option? How to Analyze and Optimize Performance of Display Ad Campaigns? How to Write Effective Subject Line for eDM? Build, Buy or Rent Email List? 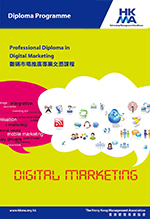 To enable students to be an effective strategist and executor in digital marketing. To train up students' strategic mindsets in digital marketing and branding decision making. To equip students with the conceptual frameworks in formulating high-impact digital marketing strategies. Course contents of all modules may be subject to change if required without prior notice. This programme commences in June and December each year, and the application deadline is normally two weeks prior to commencement date.